After a five day battle it is beginning to look like the rebels have taken the oil town of Brega but it has been at a high cost, maybe 13 dead and more than 300 wounded. As the battle for control of Libya rages on the battlefields another important battle has taken place in the realm of the media for the claim of legitimacy based on popular support among the Libyan people. rallies in Libya against the bombing, which reportedly had 1.7 million people in attendance. July 1 as many as a million rallied in Tripoli against NATO bombing. This is in a nation of only 6 million people. Note that the [China reports] link links to the Perreira piece above not to any Chinese source. That source is not linked or defined by anybody and remains a mystery. That's how this information war is played by the pro-Qaddafi people. Assertions without sources. Now others reporting on these pro-Qaddafi protests have estimated much lower numbers for these crowds, in the range of 10,000 to 30,000. It has also been said that the majority of those in attendance had some relation to Qaddafi security forces, approximately 10% of the Libya population has such an association. It has also been reported that many of the Qaddafi supporters were not from Tripoli at all but have been bused in from out-of-town, that they were paid to show up, or threatened if they failed to show up. So there have been a lot of questions about the accuracy of these reports. I got to wondering if it was even possible for 1.7 million people "the world's largest demonstration" to fit in Tripoli's Green Square and as it turns out it's not. The world's biggest city square is Imam Reza Shrine in Mashhad, Iran and is almost 600,000 sq. meters in size. The second biggest is the more famous Tiananmen Square in Beijing, China and measures more than 440,000 square meters. 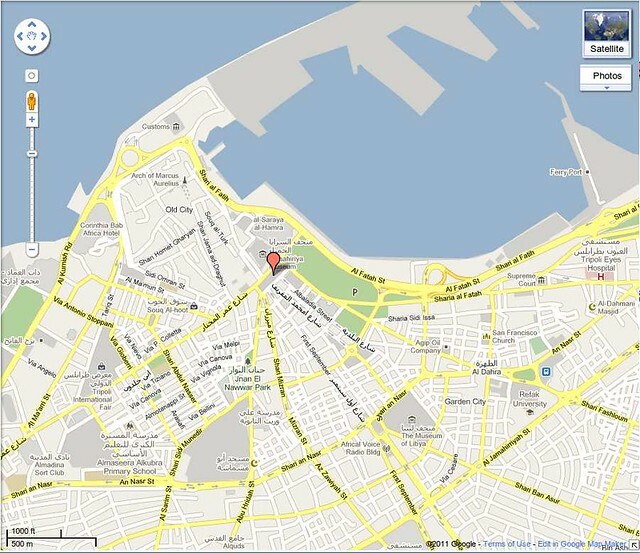 Tripoli's Green Square isn't even on the list. Green Square is roughly 646 meters long by 238 meters wide. Taking into account all the adjacent streets and odd bits like the spear of land on the right and the rectangle on the bottom I come up with an estimated size for the Green Square area of just 205,065 sq. meters. So how many people can you fit into 205,000 sq. meters? This authoritative study calls anything over 2 people per sq. meter "jammed," this report's densest category. "Loose crowds" are those in which attendees stand an arm's length from one another, and give each person about 10 square feet of space. "Tight crowds" stand less than an arm's length from one another and provide about 4.5 square feet for each attendee, while a "mob crowd" is one that has no space between attendees and gives each only 2.5 square feet. So using the most dense "mob crowd" of 2.5 sq. ft or .23 sq. 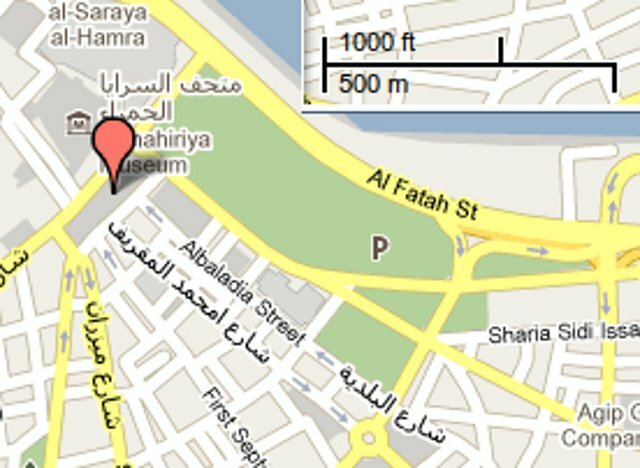 m. per person it would appear that Tripoli's Green Square could support a rally of at most 891 thousands people. 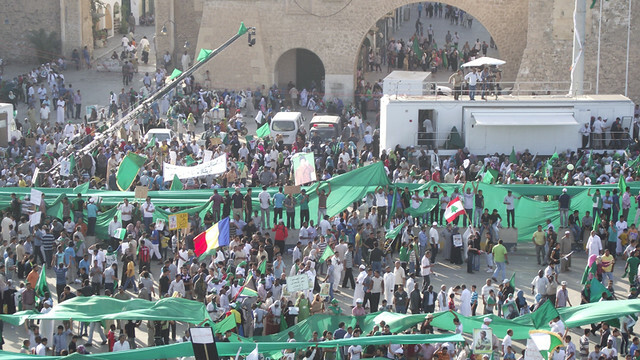 The estimates of as many as 1.7 million Qaddafi supporters in Green Square defy the possible. Besides which, Green Square just hasn't been that crowded for these rallies. Look at the closeup below. This is Green Square on July 1, 2011. Notice the spacing between the people and few seem to be out in the street beyond the square. Notice also the camera crane that some on the DocuLink filmmaker list have speculated about. Makes it look rather more like a movie set than a rally doesn't it? Look at all the extras standing around waiting for the cue. And there's that French flag again! Since France has been first among the NATO countries in attacking Qaddafi, a French flag is the last thing you'd expect to see at a Qaddafi rally. What's it doing there? In the United States, the national mall in Washington, DC is renown for it massive political rallies. In 1963 Dr. Martin Luther King Jr. spoke to a rally there that was generally considered to be about a quarter million people. This is what a quarter million people looks like. What you don't see is all the people on the sides under the trees and crowds all the way down to Washington Monument at the other end. 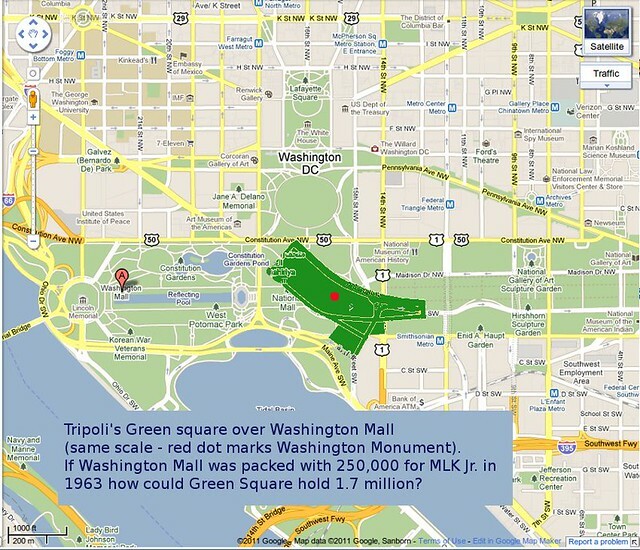 Here we superimposed Tripoli's Green Square over the Washington Mall, being careful to maintain the scale exactly. The red dot marks the location of the Washington Monument. 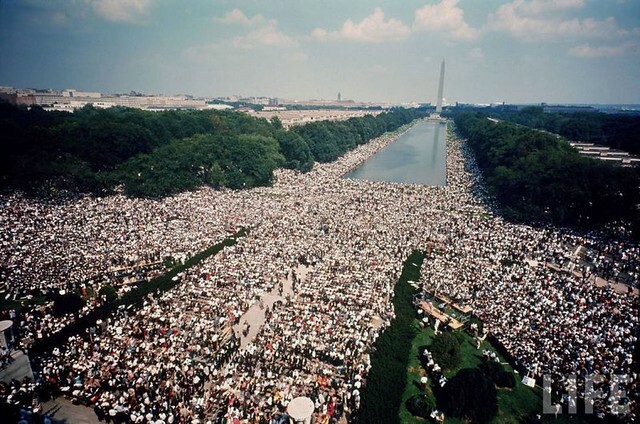 If the Washington Mall gets crowded with 250,000 people how could Green Square hold 6 or 7 times as many people? It simply didn't happen and all those that say that Qaddafi held a rally in Tripoli with over a million supporters in Green Square are selling an elaborate lie in the hopes of saving a tyrant and a mass murderer from his certain fate.